President Elect Kenny Fisher held the Club Assembly on Monday 13th June, 2016. The theme for the incoming year under the leadership of Rotary International President John Germ - Rotary Serving Humanity. "Service to humanity has been the cornerstone of Rotary since its earliest days, and has been its main purpose ever since. 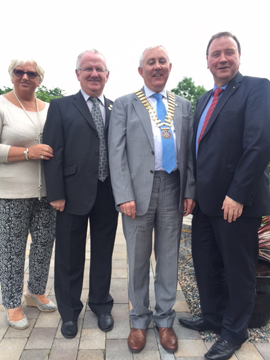 President Elect Kenny thanked President Ken for his excellent leadership during the last year and congratulated him on completing his main project at the Killadeas Sensory Garden. A full programme of activities are planned for the incoming year, and plans are being considered in bringing the Club out into the Community with visits to local businesses and organisations. The Club Chairpersons outlined their plans for the year. The visiting Assistant District Governor Elect Seamus Walsh commented on the plans by all concerned, he said that the Club was a very active one and "ticked" all the boxes with regards to District requirements. President Elect Kenny circulated the Club Assembly booklet to the members present.